Naomi Alderman's debut novel Disobedience is, as the title suggests, about a person knowing the rules and disobeying them. In this case it is the Rav's daughter from a strict Orthodox family who returns home a cigarette-smoking, bisexual, wisecracking career woman in love with a married man, ruffling the many well-groomed feathers of north London. The setting is in modern day Hendon, home to London's largest Jewish community, and a place Naomi knows intimately. It is where she was born, attending South Hampstead High School before going to Oxford. Hendon, meaning 'at the highest hill', has attracted a wide mix of immigrant communities each with their own unique codes of social conduct. None more so than the Orthodox Jewish community. Brent Street, Hendon. Photo, canonsnapper. Creative Commons. Naomi, winner of the Orange Award for New Writers 2006, and Sunday Times Young Writer of the Year 2007, comes from a notable family. Her father is Geoffrey Alderman, the leading historian of British Jewry who has described himself as an unconventional Orthodox Jew. But it is Naomi's depiction in the book of hypocrisy and double standards that has been heavily criticised by her own community. I had the good fortune to meet Naomi at a recent event and she explained: "I was brought up pretty damn Orthodox - my mother comes from Stamford Hill - although not quite as Orthodox as the characters in the book I certainly knew lots of people who were when I was growing up. The duality of Hendon has always fascinated me. I went to an Orthodox Jewish primary school and a secular secondary school, and learned how to move from one world to another smoothly, changing vocabulary and opinions." Asked what the reaction was within the close community to her book, she said: "My butcher is delighted and still mentions it to me from time to time. Don't know if they've seen an up-tick in trade as a result though! It wasn't exactly welcomed by the community - I was roundly condemned by the Jewish Chronicle and the Jewish Tribune - but I'd say it's won me more friends than it's lost me by and large, that book." Perhaps it is because the overriding theme in the book is about suppressed sexuality and how social mores can prevent a person from being truly happy. Disobedience also explores in depth how where you come from can shape your whole being and only when you move away can you see it for what it is. Lead character Ronit returns home with a very critical eye and the character's loathing of her former home jumps off the page. The opening scene is close to the end of a two-hour service marking the end of the Yom Kippur fast, in an airless, sweltering synagogue - actually a couple of 1930s residential houses fused into one - with the Rav reading the Torah in a faint voice with visibly shaking hands. He is dying and rumours have already been flying faster than tweets around Hendon and further afield of his impending departure to the next world. Readers are taken many times into the hidden quarters of the synagogue, to where the men of stature read and where women are sectioned off. Guided through many readings of the Torah, and the heavy ritualistic burdens placed on the congregation, it is clear how human nature prevails. The gossip and scaremongering, the clamber for status and the delight in a fall from grace, are all part of daily life. The kosher cafe in Hendon Park. Photo, Mike Quinn. Creative Commons. Naomi describes Hendon as "hidden, intentionally half-submerged so as to be almost invisible to outsiders". She prises open a window for readers to see this tightly controlled community where people's choices of what to eat, where to shop or time to visit and bathe, and even who to marry, are dictated by their orthodox code of conduct. Rituals and beliefs that are passed from father to son, mother to daughter, without question. Except for a single-minded, sexually adventurous and opinionated young woman who is also the only child of the most revered member of their community, the late Rav, making it all the better gossip! Add to the equation that her father's appointed successor is the husband of Ronit's childhood friend and her return opens up many jagged wounds. Ronit recalls even as a teenage schoolgirl she was sneaking into WH Smith to read forbidden magazines. In Golders Green, she passes rows of Jewish stores which appear to question why she hasn't called in to buy chopped liver or apply for a job at the recruitment agency for a Sabbath-observing company. While ignoring the kosher cafes and shops, she stops at a patisserie and rebelliously orders a chocolate cake and is suddenly mindful of all the non-kosher ingredients: boiled pig bones, colouring from dead insects, beef lard to grease the cake tin, shellfish extracts added to make the flour softer. Ronit says: "I saw a plate full of dead, decaying, unclean things". Ronit's upbringing, no matter what she thinks, is still who she is. She defiantly eats every morsel of the cake - but realises that while you can take the girl out of Hendon, it's less easy to take Hendon out of the girl. I cannot ever remember reading a book that has had my taste buds so actively engaged. Food, its preparation, and more importantly who you serve it to, is central to the telling of the story. In the scene at Levene the Butcher the reader sees the son of old Mr Levene portioning out minced meat and chopped liver in the crowded and slighty too warm shop, while shouting to his son to bring through more chicken thighs. Yet behind his back, two of his father's oldest customers who hark back to the days when the chickens had to be salted and drained at home, are disdainful of his introduction of lamb chops marinated in sticky orange fluid 'for the barbeque'. Still, as we discover, they the consider calves' foot jellyas garlicky as ever and the meatball gravy paste adequately thick. And to speak with each other in Levene the Butcher's was easy, a simple thing that could do no harm. But at the core of the book is the unravelling of a past secret and taboo romance - between Ronit and her old friend, Esti, who is married to the Rav's successor as Rabbi. We are led to believe by Ronit that her childhood sweetheart's husband Dovid is a weak character. He will simply do the bidding of the congregation and that Esti will bury her past for the sake of decency. But Ronit is pleasantly surprised at their courage in the end to speak out against the rumours and hurt. Those that were trying to push out Dovid from his place as Rabbi are shocked at his appearance in the ladies gallery of the synagogue. But what follows is a step too far for most of the congregation. as Dovid invites Esti to make a speech. She spits out the words for all to hear: "I told the Rav I desired another woman and she desired me. The Rav listened with compassion. He explained the desire itself was not forbidden. He told me to marry, a quiet man, who would not make demands upon me. In this the Rav was right. May his memory be blessed." This last sentence is repeated over in whispers as 300 people found, with relief, a sentence to which they knew how to respond. Esti carries on to say how she was aware of those who wished her gone and "my mere presence an abomination" but finishes by saying how no one should be afraid of speaking the truth. Perhaps the most surprising for Ronit, is that Dovid remains Rabbi, he and Esti remain a couple and become parents and life on the whole continues as it did before, albeit with fewer Sabbath invitations than before. 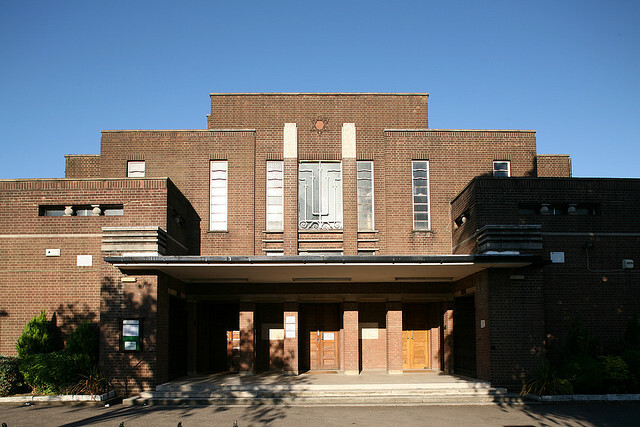 Hendon Synagogue. Photo, Steve Cadman. Creative Commons. Hendon is a village within a city, where shopkeepers know their customers by name and what their favourite items are. At the back of her novel, Naomi lists her favourite Kosher restaurants in north London where you are invited to listen to the owner shouting when a customer orders apple struddel when he has diabetes and should know better, or enjoy the "glamour Hendon-style" eating a warm lamb schwarma on a bench outside the post office! It is an invitation to the true vibrancy and soul of Hendon, where food is at its core. Although not the most attractive part of London, Hendon has a lot to say for itself and many claims to fame. It was Peter Mandelson's former stomping ground after all. But far more significantly are its connections with history. Sir Stamford Raffles, founder of Singapore is buried at the 13th century St Mary's church, which itself is said to be the inspiration for Bram Stoker's fictional "Kingsead" graveyard in Dracula. The church also defies local historians as to why it is dedicated to St Mary - a probable sign of a heretic cult of Mary Magdalene. And now Naomi Alderman's novel has put its stamp on the area's rich Jewish heritage.